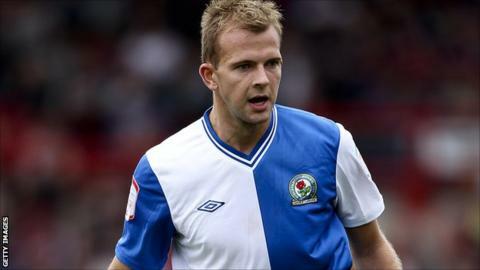 Blackburn manager Steve Kean says the money spent on striker Jordan Rhodes is "an investment" rather than a gamble. Kean told BBC Radio Lancashire that the £8m he paid for Rhodes, who has three goals in three games for Rovers, would be repaid if his side were promoted. "If he can score 20 goals [this season] we'll make money," said Kean. "We don't want to sell him. We want to be getting back into the Premier League and having him scoring goals in the division above." Rovers are a point clear of Blackpool at the top of the Championship. They have yet to lose a league match this season and continued their unbeaten start with a 2-1 home win over Barnsley on Tuesday, a game in which both Rhodes and veteran front man Nuno Gomes found the net. "I don't think we played well, but if you've got very good players, sometimes when you don't string a good performance together, you can still dig out a result," added Kean. "I'm proud of the team because I don't think we've played for a full 90 minutes to the capacity that we've got yet, but we've done it in spells. "The owners have invested heavily in the squad and we've got a lot of depth. When we really get right up to speed, we'll be a tough team to beat."